Hi, I’m a third generation born and bred kiwi. My father was a bit of a gypsy which meant we travelled a lot and I grew up in a variety of places. This is how I developed the passion for travel and exploring new places. I currently live in the best region within New Zealand – The Bay of Plenty – at a spectacular seaside resort called Mount Maunganui – and I love it. I co-founded Zealandier Tours back in 2006 and over the years we have developed this business into a totally family run travel hub. We are all passionate about not only our region, but all of New Zealand. National Geographic call us the “World in Miniature” and it is such an appropriate title as we have something to offer everybody who visits. 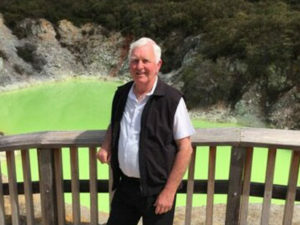 I am most passionate about sharing our local iwi – Maori people’s stories and culture, along with our active geothermal volcanic zone and abundance of natural resources. I was a nurse in my first life (as I call it), business developments next and tourism has been my third vocation of choice. Its been a great transition from each vocation to now, I am caring, I am business focused and passionate about our country, people and travel. We cater to many types of traveller, – cruise ship passenger shore excursions, local elderly traveller, inbound international traveller, transport transfers, conference delegates and partners tours, outbound traveller and the faith based pilgrimage traveller. I am surrounded by a fantastic team of people who make this business all possible. 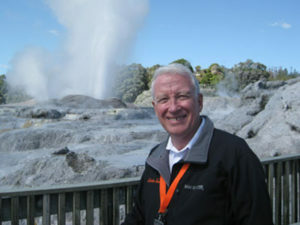 Mike is the visionary behind Zealandier Tours. Zealandier has a vision which is never static. It is that which turns dreams into possibilities and possibilities into realities. The vision gives us direction, motivation, creativity and resilience. I’m married to the most patient man in the world. We have two daughters, 2 horses, 2 ponies, 4 lambs, 2 cats and a dog. I lived in the USA and Australia for a time but came back home to settle down. There is no place in the world like NZ. I work from home, enjoy my surroundings of natural forest and totally love my lifestyle. Travel is in my blood – I am Jan’s daughter, and born to travel. I’ve been fascinated by people and places ever since studying Geography at university. 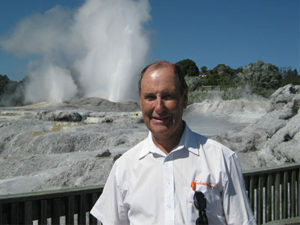 For most of my life, I have led group tours throughout New Zealand and overseas. In recent years I have helped people enjoy the delights of Australia, Canada, USA, the Middle East and our own wonderful part of the world – the Bay of Plenty. I am married to Katrina, have three children and nine grandchildren. My interests are conservation, running, kayaking, mountain-biking and genealogy. I was born & schooled in Dunedin. Originally a banker who served in both North and South Island. Later became owner/operator of Mr Whippy,a mobile ice cream franchise and a kiwifruit orchard contracting business which both kept me busy. My interests are wide & varied. 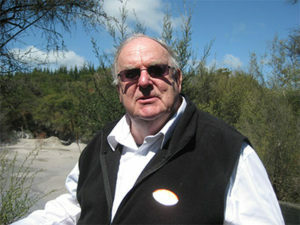 An avid All Blacks rugby sports fan and keen on cricket & trout fishing.Proud member of a local LIONS club. Totally committed to my partner Jude, and have 2 adult children, Christopher,a Lawyer & Pippa,a Beef & Sheep farmer. I am totally blessed with 5 grandchildren. I am a 4th generation Kiwi who comes from the South Island Mainland. For the last 38 years I have become a local making Tauranga my home. I come from a background of Radio and Television Broadcasting, Marketing and management. Over the past 12 years I have been involved with Transport and Tourism. 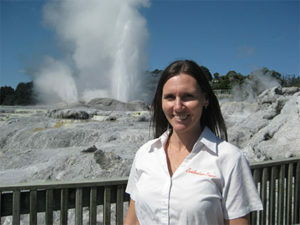 Hosting and Guiding Cruise ship tours throughout the Bay of Plenty is my passion. Be it Rotorua or Waikato’s Hobbiton I will have a story to share with a cultural background and history to excite your imagination. Looking forward to hosting you on my tours. I am a third generaration New Zealander. My great grandfather migrated here in 1860 with his wife as part of the Brittish Armed Forces and settled into Katikati, so I am a born and bred local. I chose a career in road manangement transport, married Shirley and we have 2 daughters and 6 gandchildren. Retirement is something that I know about but choose not to participate of. I am busy enjoying looking after my 38 acres of land, or driving big rigs or guiding tours to contemplate retirement. I have had a life long involvement with Missions and have spent some time living and working up in Papua New Guinea. I love to be around people far too much to stay at home and look forward to sharing my knowledge & stories with you on one of my tours. I’m another South Island Mainlander – initially, but have spent many years now living here in the Bay of Plenty. I have a background in newspaper & later owned a menswear retail shop. I have been hosting visitors from the cruise ships since 2005 on the many tours that are available from the Port of Tauranga to Rotorua, Waitomo, Hobbiton and many other tourist attraction sites within the region. We are aptly named with plenty to appeal to everybody. I have a relaxed touring style that ensures that you have an enjoyable day visiting all the main points of interest, and provide enough information about the area that would be of interest to you. 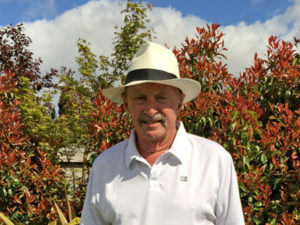 Originally from UK but have been a New Zealander for 60 years. (so I think I can call myself a local now). 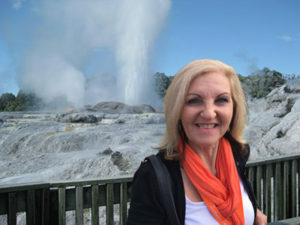 I have lived with my wife Noeline in Tauranga for over 18 years following a career in aviation both in NZ and overseas. We have two adult children and 2 grandchildren. 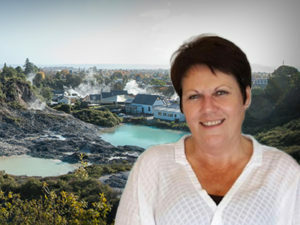 For the past 6 years I have worked as a Tour Guide taking passengers from the cruise ships at the port of Tauranga on excursions to Rotorua and to the Hobbiton Movie Set. My favorite Zealandier tour is to the Hobbiton Movie set. Why you may ask ? Because many tourists are on a pilgrimage or “have a must do on their bucket list” so they are animated and show enthusiasm and excitement, which makes for a fun day ‘tour’ for both of us. I was born in England and came to New Zealand’s South island as a young child. We moved to the Waikato in the North Island where I completed my schooling and a management degree and then owned a bookshop . I met and married Carena and in 1986 the family started working with the Baptist church in starting new churches and restoring ones that were fading and we are still involved today. Stephen and Carena have lived in Tauranga in the lovely Bay of Plenty for the past 23 years and are now living at Omokoroa ( a beach suburb 25kms north of the city ) enjoying the beach and scenery. 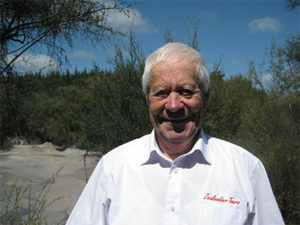 I have been a bus driver for a number of years and over the past three have been a tour guide for Zealandier Tours. Most of my working life I have been employed in the Tourism & Hospitality industry. I have managing lodges, worked as a Purser on a cruise ship and behind a bar so have worked with quite a diverse range of people from many cultures. 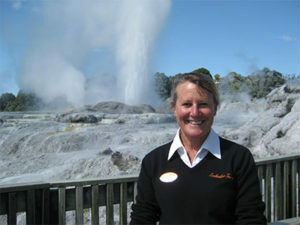 Over the past 7 years I have been fortunate enough to work for Zealandier Tours as a driver guide which I enjoy immensely.Being born in the Bay of Plenty region I have a great connection with the Culture and also extensive knowledge of this area.I live in the beautiful beach resort of Mt Maunganui with my husband and our families who live close by. We both love fishing and enjoy the outdoors and being out on the water. Hello everyone, I’m from Scotish decent, my father was a Scotsman and my mum’s grandparents both came from Scotland in 1869. Myself I was born in Blenheim at the top of the South Island. I have lived in the beautiful Bay of Plenty since 1970, firstly Te Puke where I learnt to pick pack and prune Kiwifruit then ventured into growing flowers for local & export markets – mainly carnations. 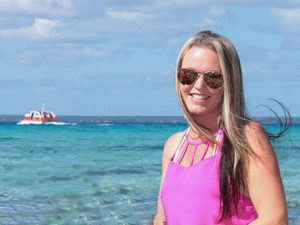 I am totally adventurous and learnt to ride a motorbike in my 40’s, I have had my own trucking business, I have driven buses and now I am a tour guide, finding I absolutely love hosting tours where I get to meet so many new people from all around the world. I love to travel and have recently returned from a trip to Thailand and Bali. I love music and my new favourite pastime is open mic singing. My life has taken me on many journeys and I’m looking forward to spending one of them with you. 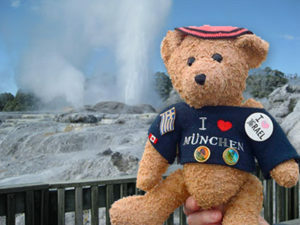 Munchen the bear was born in Munich in Germany in 2010 and has travelled to Greece, Australia, Norfolk Island and Israel as well as many other places around New Zealand (and has the badges to show for it). 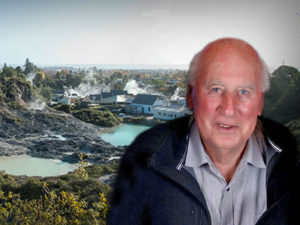 He often comes on Zealandiers’ tours especially to Rotorua with Stephen. 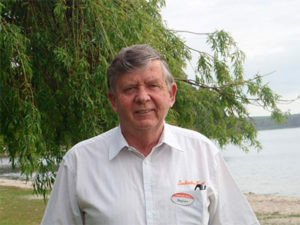 He is a great friend and companion especially to the younger children on the tours.